Is it just me or does my hand look fat? This is a part early birthday present to myself and part of the Treat Yo'self idea I talked about here. About two years ago, I complimented one of my sister's friends on her necklace. She told me that she got it from a website called The Vintage Pearl. I loved it so much that it stuck in my head since then. I finally got my own! 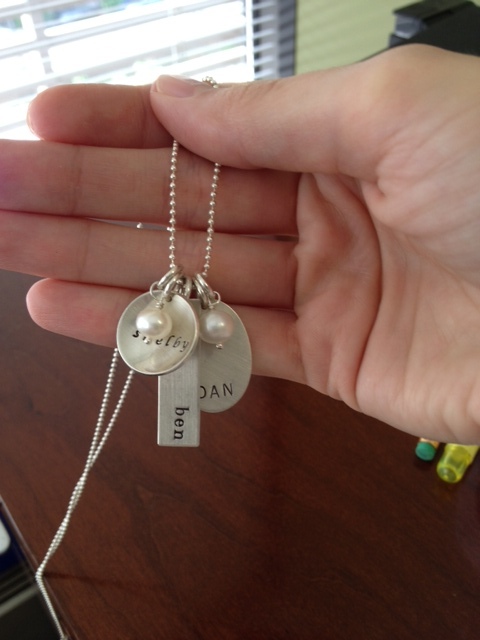 It is basically an online jewelry store where you can get pretty personalized stamped silver charms for necklaces. I got a charm for Ben, Dan and Shelby. The necklace that I got was the "eclectic charm necklace." It comes with a standard 18" chain, but I paid more for the longer 24" chain, and it is the perfect length for me. I love it! It is definitely perking up my working day and keeping my family close to my heart.